When we were kids, we had to carry our food in the skin of the animal our parents removed it from. We walked to school in a Stage 1 Smog Alert, uphill, both ways. My how times have changed! As our focus here is usually on teaching fellow underarm-scratchers how to cook, it isn’t very often we have the opportunity to delve into matters of children. Seems like we found the right person to help us change that! MMS: How did you get the idea for the bento boxes? Lorelei: It's important that your readers understand that the lunches I make for E aren't technically bentos at all - they only take inspiration from them. I honestly don't remember when I first got the notion - but I know I saw pics online (probably through someone's FB post, but possibly on Flickr) of really cute bento-style lunches, read that Japanese mothers do this as an expression of love for their children, and thought it was something unique I could do to show my love for E and make healthy homemade lunches more fun. After looking at some blogs by American mothers who are doing their twist on Japanese bentos, I became more confident that I could actually pull it off with my time and budget constraints. MMS: What did/does E think of them? When I just asked E what she thinks of her lunches, she said "They're beautiful!" She likes to take a peek at them every morning before I close up the lids of the boxes and ooh and aah over the contents. I tell her she has to eat at least some of the veggies in order to eat the dessert, and so far, she has complied (she knows if she doesn't, she won't get dessert in the next lunch!). MMS: Did you get any specialized tools to make them? Special foods? I did acquire a lot of tools - the ones I use the most are the metal cookie and vegetable cutters to cut veggies, fruit, cheese, etc. into shapes and/or create designs. I need to get some more cookie cutters so that I have more seasonal shapes available - I have tons of leaf shapes and a few Christmas shapes, but nothing particularly spring-ish or summery. Sometimes I've been forced to improvise and cut shapes by hand, and the results have often been amusing. I hope to get better at that as time goes by! I also get a lot of use out of the sandwich cutters that cut the sandwich into shapes while sealing the sides so the filling doesn't leak out. Ones I don't use as often but still love are the Japanese egg molds that make a hard-boiled egg resemble a bunny, bear, heart, fish, etc., colorful food picks shaped like animals, leaves, etc., silicone cups to hold blueberries, Goldfish crackers, etc., and shaped sauce bottles/containers for dressings, dips, etc. Bento supplies can be found on Amazon, E-bay or through Japanese/Asian specialty stores online - but pay attention to shipping costs before purchasing, which can be equal to the value of your merchandise! 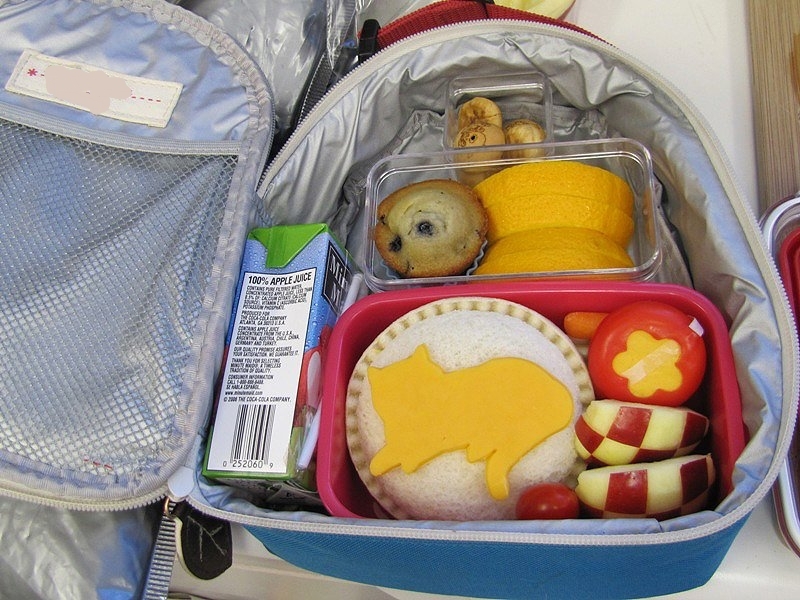 As far as foods go, anything miniature is perfect for bento boxes. Small fruits like berries, grapes, clementines or satsumas, petite apples (you can find small Gala, Jazz, and others by the bag at the grocery store), Forelle pears, kumquats, etc. are all wonderful. Baby bell peppers, broccoli florets, grape or cherry tomatoes, snow peas, sliced cucumbers, baby carrots and celery sticks are great ways to get some veggies in. Grocery stores sell containers of mini muffins (multiple flavors in one package!) and mini cupcakes that are perfectly sized for kids' lunches. Sara Lee makes mini burger buns that are great for small sandwiches, and Smuckers Uncrustables frozen PB&Js are great to have on hand for those days when you don't have time to make a sandwich (which for me, are far too many!). Sometimes it's a challenge to have enough fresh produce to create variety in her lunches without wasting some due to spoilage. If you can get your produce from a local farmer's market, it'll last longer. MMS: How many have you made? So far I've made 89 bento-inspired lunches for E - four per week since she's started school, with the exception of sick days and vacation days. Fridays are "pizza day" at school, so I give myself Fridays off and let her have pizza for lunch. MMS: How do you come up with new ideas? Some ideas for designs have come from other lunches I've seen online, and some have been inspired by the weather/season, holidays, and sometimes just by what I have available. For instance, I had a little red wax heart that I'd cut from her Babybel cheese and thought it looked a little like a cat's nose - and I had cheddar and swiss cheeses to make the face, mane and whiskers, green gumdrops and yellow sprinkles for eyes, a little strip of grape tomato for a mouth, and voila! A lion. I have been stuck in a rut ingredients-wise, and need to branch out so that she gets more variety. Some friends have sent fabulous ideas for vegetarian sandwich fillings, and I have yet to try many of them. Usually it's time constraints that keep me from doing more experimentation. I need to find a way around that and prepare stuff in advance so that I have it on hand and don't have to try and make it AND assemble it the morning of. MMS: Any fun stories about the boxes? I've heard that some of the teachers who supervise at lunch time and some of her classmates make a point of checking out her lunches every day, so that's nice to hear. And of course, my friends on Facebook always have sweet things to say - usually something along the lines of "Will you make my lunches, too?" Thank you Lorelei! Your food art is AMAZING! 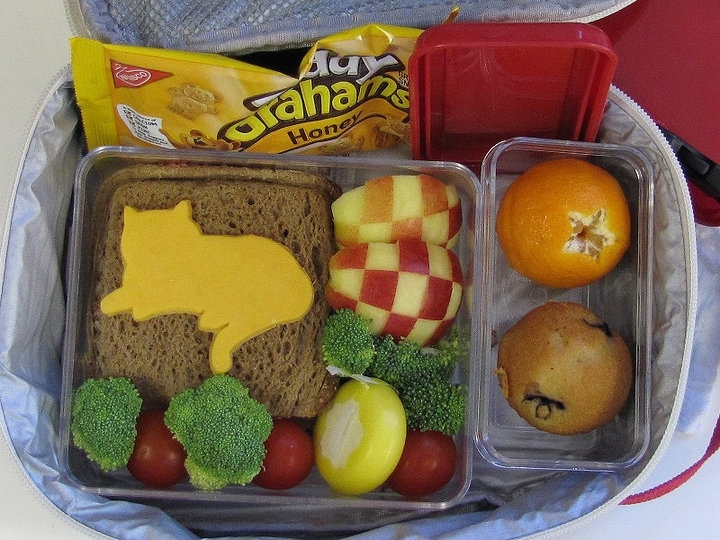 Bento 6 - Vegetarian bologna & cheese pocket sandwich (with cheddar cat cutout), broccoli and cherry tomatoes, Babybel cheese, apples. Snack: clementine and mini blueberry muffin. 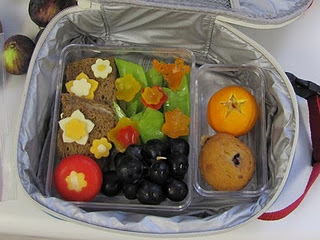 Bento 8 - Peanut butter and honey sandwich with cheese flowers, Babybel cheese, grapes, snowpea "leaves" and bell pepper flowers and butterfly. Snack: clementine and mini blueberry muffin. Bento 36 - Uncrustables sandwich with cheese stars, apple slices, carrot sticks and cherry tomatoes, Babybel cheese. Snack: mini cranberry orange muffin and clementine. Dessert: chocolate Teddy Grahams. 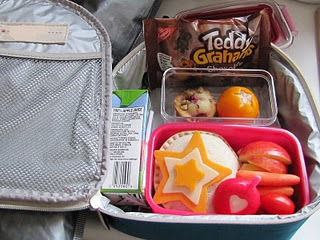 Bento 41 - Uncrustables sandwich with cheese stars, grape tomatoes, celery sticks and orange slices. Snack: mini pumpkin spice muffin and apple slices. Dessert: Meiji "Pucca Choco Pretzel" from Japan. 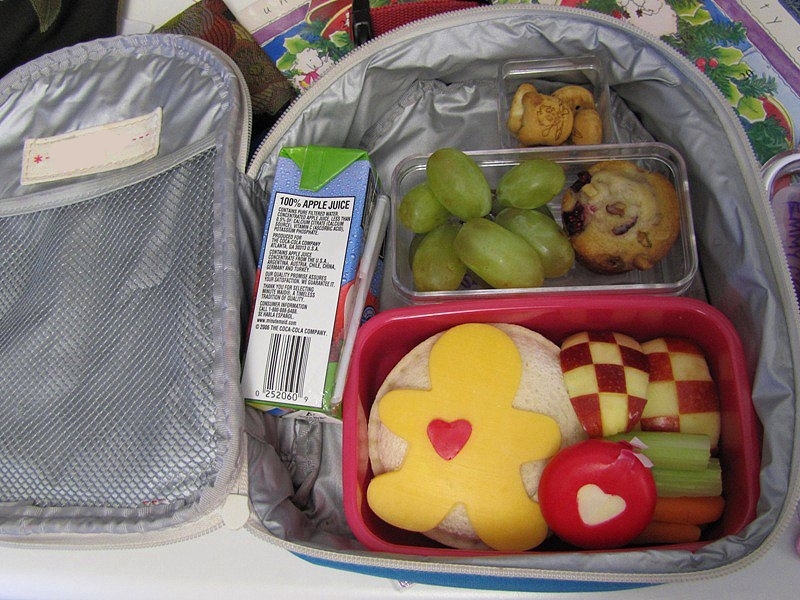 Bento 44 - Uncrustables sandwich with cheddar gingerbread man, checkered apple slices, celery and carrot sticks and Babybel cheese. Snack: green seedless grapes, mini cranberry-orange muffin. Dessert: Meiji "Hello Panda" chocolate-filled cookies from Japan. Football is definitely 1 of the largest sports in America. It has a important following. oh my goodness!!!!! !these sing sooooo much more doable than the bento lunches i have seen- i actually think i will try them- the cut out cheese with the pb& J....and the sweet checkerboard apple....my kids eat at home, but this looks like FUN!!!! thanks for the ideas!!!!! "sing was supposed to be "seem" .....it is VERY distracting at my house! Wow. Somehow we missed your comment until NOW. Apologies and thanks!